Palomar Health welcomed Geoff Washburn as the Vice President of Human Resources in fall 2018. He brings more than 30 years of experience to our team. 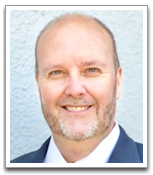 Geoff has spent his entire career in the healthcare field and has worked in nearly all facets of human resources. He is a highly regarded leader with extensive experience and strength in labor/employee relations, recruitment and retention, compensation and benefits, leadership development and HR information. Most recently, Geoff was the Vice President of Human Resources in Los Robles Hospital and Medical Center in Thousand Oaks, California where he was responsible for more than 1,700 employees and 600 physicians across four locations. In this role, he led the shift of the HR department to a comprehensive HR business partner model, advanced their Lawson reporting and worked to improve regular compliance. With a focus on being high-touch, responsive and customer-focused, Geoff brings the knowledge and leadership skills that will not only sustain, but improve our HR process. Learn more about our Board of Directors, Executive Management Team, and our recent Awards.